Physics is one main subject which has a number of mathematical problems and hence causes a headache to many students. The true fact is that physics is one fascinating natural science which has assisted people to understand the world that is around us. Physics has also helped in advancing the world in a technological manner. This inspiring and interesting subject can be boring for a number of students. 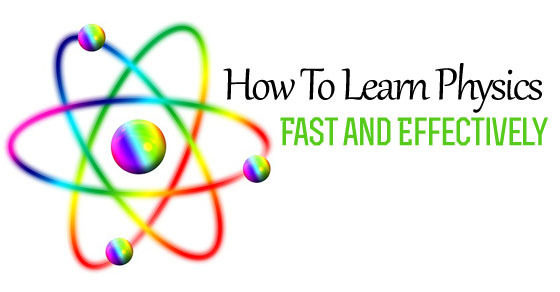 Let’s glance through a few tips about how to learn physics fast and effectively and how to get better at physics so that one can score well in the exam. The following mentioned are few physics tips on how to be better at physics and learn physics the easy way. Central theories are the main aspects when physics is considered. The central theories are the ones from which other aspects develop. All the mathematical problems which need to be solved in physical would evolve from these central theories or with a slight variation from those theories. It is hence good to avoid memorizing problems, understand the basic concepts and theories along with their principles and work out problems. It would be suggested to develop mind map so that you can have an overview of the basic physical concepts and understand the subject easier. Physics is a subject where numerous forces in the universe and its relationship with others are described by means of equations. Few equations are found to be simple whereas many are complex. Tackling and using the simple as well as complex equations wherever necessary is quite difficult. The basic concepts in physics are very important from where complex equations can be derived. The equations are used in a number of places in many problems and hence it is advisable to memorize the equations so that they can be used in the right place instantly. There are a number of mathematical parameters that are utilized in physics. If you have the capability to handle and solve many problems and formulas then you can master physics quite easily. Studying maths parallel with physics can help you understand and solve mathematical problems in physics. Simple equations can be derived easily whereas complex equations are to be derived and you need to know why. Hence, a good understanding of the basic equations and how they are derived is important. Learning how each equation works is necessary. In physics, it is good to simplify the problems as much as possible. Solving problems in physics may seem to be tough for many students but once they analyze and they will find it to be easier than they thought. It would be best to remain calm and solve the problem to a stage where you’re familiar with. Whenever any problem in physics is solved, run through the important points that are mentioned. Also, get to know the details that you are trying to solve. Avoid details that aren’t required for the problem. Important aspects of the problems are ones that would help you score in the examination. Hence, focus and remember to write those points without fail. Drawing and graphics are considered as the best ways by which you can represent the above-mentioned problems too. In order to understand the basic concepts and detailed part of physics, it is mandatory to make drawings. It is always good to present any concept with a help of drawing, as it would help you score more and understand better. In physics, it is important to write the correct answer with the right units to help you score high. If you wish to gain credit for whatever problems you did, then writing the correct unit is important. Physics usually makes use of metric/SI measurements and some of the commonly used units are power, watts, acceleration, meters/seconds², force/Newton and more. Physics is a study which involves principles, concepts, units and new words. Make a note of all this so that you can follow your theory and enhance your memory which helps you face problems in the subject. In order to remember all this, flash card or memory study can be useful and help you remember. Read the syllabus and get to know what you’re about to study for the term. Make an attempt and try to preview your textbook. Make a note of the important themes and principles and also run through a few problems. When physics is considered, the student can learn it if they understand the concept of class. Hence, the student needs to participate actively in the class, listen and take proper notes. By this way, there are no hassles or confusion after reviewing. Once the physics lecture is over, it would be best to review and read through the taught lesson. If there are any doubts, it can be clarified on the same day. Revision of physics lesson makes the concept clear and also gets registered in the mind. It is a known fact that physics has a number of problems, in order to be a good problem solver there are few aspects to understand and follow. To be effective and expert in problem-solving, one has to remember the following technics. The student first needs to analyze what the problem is about. Then he has to read and understand the problem and get to know what is to be found out. Depending upon the problem, he needs to think about what information, data or formula is to be applied. Once worked out and the solution is found, he needs to find out if the solution is appropriate. Similar to math, programming and other subjects, solving problems in physics is a skill. For the same it is important for students to practice physics problems often. When students solve a number of practice and example problems, they become expert problem solvers. Apart from preparation for exams, solving problems also help you gain clear knowledge about the concept. It can be a habit for students to learn and practice problems from their assigned syllabus. In order to score well, the student should not only stick to school syllabus and work out assigned problems. They can get one step ahead and start solving problems which aren’t assigned and not in the syllabus. There are a number of sources online which helps in practicing problems. Other problems in other books and online sites can be the best way to practice problems. With the rapid advancement in technology, the educational field is well-benefitted in a number of ways. So, with the development of a number of apps, physics also has a number of apps which is beneficial for students. These apps are extraordinary as they teach the subject with theory, formulas, and principles. They also assist in problem solving and also provide solutions to number of problems. Ones who prepare for competitive exams can make use of these apps. In order to learn and understand physics quickly, online lectures are one best way. These online sources are available for free and from famed lecturers working in top universities. Important and complex topics are discussed in these lectures which make it easy for students to understand. Listening to awesome physics podcast is yet another way by which you can learn fast. There are dozen free audios available and obtaining them online and utilizing them can help students in better understanding. For people who find the subject tiring and exhausted can try fun stuff videos available. These videos have pictorial representation which is funny but explains theories and concept. This is an interesting way for students to get to know the concepts. For example, super Mario physics, Britney spears guide to semiconductors and interactive physics simulations. In order to study fast and effective, it is good to follow the everyday syllabus at school. Completing the chapter covered each day and revision of the same at home is one way to complete each unit. Seeking help from teachers, friends in the form of group study, tutors and third party sources such as online videos, books, educational sites are few ways which help you study and understand the concept well. Unlike other subjects physics requires good practice in order to learn fast and understand fully. Students can practice all the examples, problems at the end of the session. There are a number of sites that offer online test and mock test for physics. These are the best solution to analyze and test your understanding in the subject. Participation and writing these test can help you face exam related problems and other physics theories. There are many sites where students just need to register and participate in the tests. Crash courses are private institutions where they teach physics in a short period of time. They are fast and effective and cover up topics very quickly. Students can enroll in such tutorials and get to learn physics fast and effective manner. These people post a schedule and work according to it and complete the portion. Physics is a subject which should be learned in a gradual manner so that concepts and theories are understood well. In that manner, the student must make a proper schedule daily to cover up all topics with complete revision. Apart from learning other subjects, physics must also be learned every day with a stipulated time. Students should remember not to gather up all the topics and rush at the end during exam time. That will only result in confusion, fewer marks and an unclear understanding of the concepts. Hence starting to study early and completing early will be helpful. There are many theories and concepts in physics which can be easily understood and registered in mind by making use of laboratory experiments. Experiments help in a clear demonstration of theories and assist students to write their exams in an easy manner. By this way, the concepts are registered for a life time and they do not forget. It is always good to keep up with the course and not fall behind. Try to cope up with the course within time. It would be a good habit to read through the lesson before you attend class. By this way you do not have to take notes for everything, you can focus more on topics that you don’t understand and clarify if any. Remember to study physics every day. Reading and listening properly are few ways to learn physics effectively. The above mentioned are a few tips and tricks that can be followed in order to learn physics fast and effective. Physics is an important subject and hence concentrating on the subject from the start can be a perfect way to understand and score well. With the apps and online sessions, studying physics these days has been quite interesting and understanding. A free tutorial which has online presentations for studying physics is beneficial for many students as well as lecturers. With such advancement in technology, availability of online test, mock test, and many other resources are sufficient for learning physics. Students who find it boring and exhausted to study physics can run through these mentioned pointers and tips for studying physics. Learning physics with the right understanding can help you land in research and contribute the best to the world outside. Be a leader in physics by starting to learn from the basic and follow the right agenda. Research online and gather a number of resources to learn physics in a fast and effective manner.